a gripper in the opposite hand. Every 4 years we sit and watch in astonishment at the feats of strength performed by the Olympic gymnasts. When performing a strength move, it is easy to see that all of his muscles are trembling with tension. As Pavel, has told us many times before, tension equals strength. It seriously does. As a trainer I have noticed that many of my clients have trouble with full body tension. Tighten one muscle and they relax that other muscle they were supposed to keep tense. It's a vicious circle. This is especially true when using your lower body to facilitate movement in your upper body, and vice versa. You don't want to be tense all the time, however. If a boxer or fighter were to tense all his muscles and maintain tension, he would exhaust himself prematurely and probably get knocked out or submitted. Tense-Loose-Tense. Fast and Loose. The idea is that you need to be able to call upon maximal tension on command, and be able to release that tension and relax until tension has to be called upon again. To continue with the fighting analogy, we can all accept that the force of a punch doesn't come from the arm, it comes through the arm. Punching power has much more to do with your stability and power in your legs than how much you can bench press. This being said, any leakages in tension between your foot and your hand hitting the target are going to result in a loss of punching (or kicking/deadlifting/pressing) power. To sum up, if your leg is a wet noodle when you attempt to punch or press a heavy kettlebell overhead, you are in trouble. This can be easily fixed. It is important to remember that your body is not like that of the Frankenstein monster. You don't train your left arm on Mondays and your right leg on Tuesdays. They all have to work toward the same goal. Let's take the pistol as a prime example of tension. 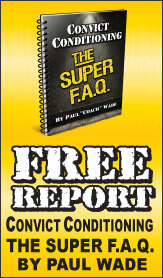 There are many who can crank out bodyweight pistols but when you add a considerable load, it all falls apart. You can get away with being loose during a low weight maneuver. "It's all easy until it gets heavy." This can create bad habits that we have to break. So, you have to stay tight, not only in the part of the body performing the task, but everywhere. This is hard to do. So we have to connect the upper body to the lower body through the center (glutes, abs). Some simple drills will make this easy to achieve. The Bottom Up Pistol. Take a light kettlebell, 12kg or lighter to start, and clean it bottoms-up to the shoulder. Slowly descend into a pistol keeping tension running from your hand to your feet. Try to feel the tension making your body lighter—less "dead weight." Things to remember: don't do this if you can't already perform a weighted pistol (with the weight held in the rack position) or a bottoms-up clean. 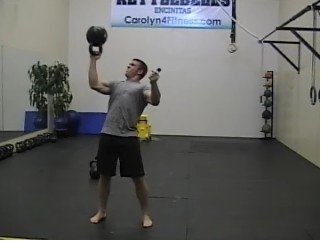 You can do this with double kettlebells as well but remember this is a very advanced maneuver. I have also had some success holding one kettlebell bottoms up and a gripper in the other hand to really intensify the full body tension. The Bottoms Up Press. The bottoms up press is a great way to have automatic feedback if your pressing groove is bad as well as helping you root through the floor. I recommend holding a gripper in the opposite hand to help you feel the tension. If you have a training partner, there is a lot of value in having him push the back of your knees. If you're legs aren't tight, they will bend. So don't let them bend. Perform this with 2 kettlbells and you will really feel it! Bottom Up Getup. The most challenging, in my opinion, when the weight gets heavy (though the pistol is no joke either!). If you don't stay tight, the weight will fall, hopefully not on anything important. Again what we have is a self-correcting connection between the upper and lower body that runs from the grip (very important) to the feet through the center. Go very light to begin with and enjoy. The techniques you learn to feel in these drills can be applied to almost any grinding lifts and you will feel the weights get lighter. Learn to connect your upper and lower body and you will be a force to be reckoned with. Move bigger weights, punch harder—who could ask for more?